For most of us, making a difference and creating change around huge global problems like the destruction of the world’s rainforests and climate change seems way too big and too hard to imagine taking on. As parents, between work in and outside our homes, getting to and from lacrosse games, music and dance classes, putting nutritional meals on the table, arranging play dates for our kids, and finding time for the occasional play date of our own, our lives are full, busy, and regularly frenetic and hectic. Yet as parents, our job is to create a safe, secure and sustainable future for our children, so taking on huge challenges like climate change is definitely in our job description. By “connecting the dots” between palm oil production, climate change, orangutan habitats, snack foods and our purchasing habits, we will be doing our job and protecting our children and the planet. Join me and The Rainforest Action Network (RAN) on May 20,th for a Global Day of Action to cut Conflict Palm Oil. Together we are demanding that PepsiCo stop using Conflict Palm Oil in its snack food brands and start helping us tackle and create solutions that will fight huge problems like climate change and deforestation. Join us as we show our children how powerful they can be and how solutions to seemingly overwhelming global problems can be positive, fun and sometimes, frankly, pretty simple when we tackle them together. There are three easy steps. First, check out our Day of Action Toolkitand come up with a vision for your photo action. Second, add the details of your photo action to the eventmap. Once you get your image, upload it to RAN’s SmugMug Gallery and post it to Pepsi’s Facebook Wall with this message: #PepsiCo, the power to Cut Conflict Palm Oil is #InYourPalm. Grab the kids in your life and watch and listen as Ashley Schaeffer Yildiz, a new mom and RAN Palm Oil Campaigner, shows us “how it’s done” by giving us some great ideas we can use to persuade some of the biggest companies in the world, the Snack Food 20, to join us and do the right thing. By changing where they source their palm oil these global companies can stop the production of Conflict Palm Oil which will help save important rainforests, slow down climate change and also protect the homes of some of the world’s last remaining orangutans. These companies know that we are carefully watching what they do. In fact several of the major Snack Food 20 companies, including Mars, Kellogg, General Mills, Unilever and Nestle have recently responded to consumer outrage by announcing new commitments and the strengthening of their palm oil purchasing policies or sourcing practices. PepsiCo however, remains a key laggard. Just as the Snack Food 20 have sourcing choices for their products we have choices too. We can choose to support brands and buy snack foods that don’t contain Conflict Palm Oil. And the good news… the power is #InYourPalm! Call a family meeting today, and come up with your own family plan for the Global Day of Action. These actions can be big or small, in parks, on college campuses, at home, or even at Pepsi branded locations around the world. The beauty of the day of action is that each of our actions will be unique, but they’ll have two things in common: they will include the words #InYourPalm in some way, shape or form and will connect our families to folks around the globe who are united in our efforts to end rainforest destruction caused by the production of Conflict Palm Oil. Whether you are 8 or 80, the New York Times, The Union of Concerned Scientists, or even Ashley’s new baby boy, together we can “change the world” by taking on big problems one day at a time! 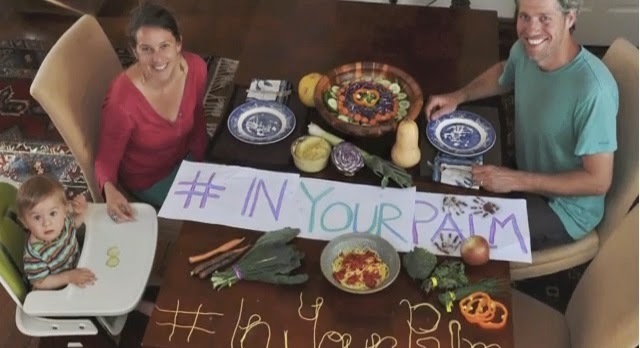 Please join us and invite your family, friends and neighbors to take part in the May 20thGlobal Day of Action to Cut Conflict Palm Oil, the power really is, #InYourPalm!